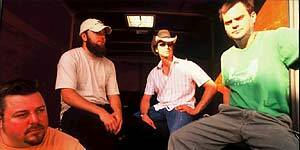 Started in 1995, and named after founder Graham Guest's fifth generation grandfather, Moses Guest, is a Texas-based, Southern Rock band that has just enough Pop, Jazz, Funk, and Country in its veins to appeal to audiences of all ages and origins. The current lineup formed in 1998, was voted "Best Rock/Pop Band" in the 2001 Houston Press Music Awards, and have won numerous Battle of the Bands contests. The band has been selling out shows in Houston since 1999, and concentrating hard on winning over their region, with frequent tours through the South and West. On the recording end, the band has self-produced four CDs, and one EP, on its own record label, Aufheben Records. Their last effort, a double, self-titled, studio disc set, "Moses Guest" was released in 2002, and is currently still being played by everyone who bought one. Moses Guest has shared the stage with many great acts in the past few years (and ain't that the truth), including Moe (twice), Steve Miller Band, JGB Band, Willie Nelson, Los Lobos, Leftover Salmon, String Cheese Incident, Robert Bradley's Blackwater Surprise, David Nelson Band, Rebirth Brass Band, The Jayhawks, Lisa Loeb (acoustic), and Colonel Bruce Hampton and the Fiji Mariners (on H.O.R.D.E. 1998 sidestage in Antioch, TN).